Pond aerators will help you keep your pond healthy. The fish and plants and event he beneficial bacteria in your pond need oxygen. Pond aerators get oxygen into the water. If you are looking for some excellent pond aerators, you have come to the right place. 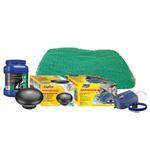 Here at Pond Depot, we have an excellent stock of pond supplies.